Chamomile is one of many herbs whose benefits scientists do not fully understand. Natural healers have used chamomile for thousands of years to treat everything from irritated skin to cancer. It's best known for its ability to calm and relax the body and aid sleep. New evidence indicates that chamomile may have a positive influence on weight loss. Steep chamomile for at least 10 minutes before drinking to extract the maximum properties from the plant. Serve the tea warm or chill to make iced chamomile tea. Drink a cup of tea before each meal, as chamomile stimulates the production of gastric juices, which may promote weight loss, according to the "Journal of Nurse Practitioners." Drink a cup of chamomile tea before bed to help calm your body and promote a restful night's sleep. Sleep imbalances disrupt insulin production and other hormonal processes that contribute to weight gain and make it more difficult to lose weight. Drink chamomile tea when you're feeling stressed or anxious. Stress wreaks havoc on your hormonal systems and promotes fat gain, especially belly fat. Stress reduction efforts help you regulate stress hormones and lose weight. Create a calorie deficit by eating less, exercising or both. 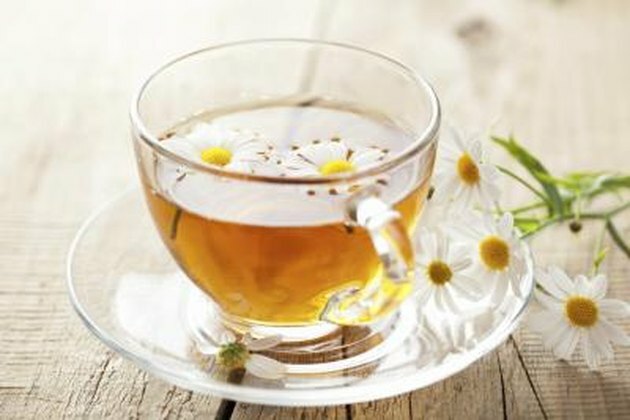 Chamomile tea itself will not cause significant weight loss and must be combined with a sensible diet and regular exercise to effectively burn fat and increase fitness. Monitor the way chamomile tea affects your health as there is no established safe or effective dosage. Chamomile may cause allergic reactions in people with ragweed allergies.